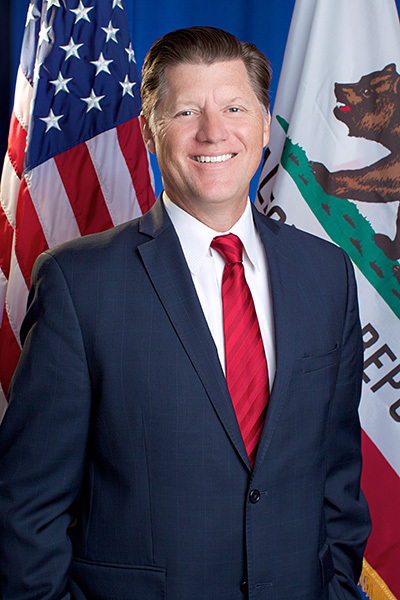 Brian W. Jones was elected in 2018 to serve the people of California’s 38th Senate district. He is Chair of the Senate Republican Caucus. Prior to serving in the Senate, Jones was a Santee City Council Member for eight years from 2001 to 2010 then again from 2017 to 2018. Jones was the representative for the 71st Assembly District from 2010 to 2016. Jones grew up in the district and attended Santee Elementary, Cajon Park Middle School, and Santana High School. He continued his education at Grossmont College before earning a bachelor’s degree in business administration at San Diego State University. Some of the legislative priorities during his Assembly years were lowering taxes, improving the economic development for small businesses, supporting our Armed Forced and veterans, removing unnecessary red tape, and protecting the Second Amendment right. Jones' legislative achievements include the introduction and co-authorship of "Made in America" legislation, which makes it easier for manufacturers to do business in California, legislation to support the expanding craft beverage industry in California, and legislation allowing non-motorized vehicles such as scooters, bicycles, and wheelchairs in skate parks. He became well known for his annual 2nd Amendment Awareness event, which educated his constituents on the Second Amendment rights and related state legislation and gave attendees opportunities to learn how to control a firearm safely or improve their accuracy. Jones’ commitment to the quality of Californians’ lives resulted in many awards including, California Rifle and Pistol Association Outstanding Leader (2016), the Civil Justice Association of California Civil Justice Leadership Award (2015), the California Society for Respiratory Care Legislator of the Year (2015), the California Chiropractor Association Chiropractic Champion Award (2014), Lakeside Chamber of Commerce Legislator of the Year (2014), and Tech America's "Tech Champion" (2012). Jones is married to his wife of 26 years, Heather. They enjoy spending time with their three children, Christopher, Melina, and Matthew.